Goodreads Summary: It's 1996, and Josh and Emma have been neighbors their whole lives. They've been best friends almost as long - at least, up until last November, when Josh did something that changed everything. Things have been weird between them ever since, but when Josh's family gets a free AOL CD in the mail, his mom makes him bring it over so that Emma can install it on her new computer. When they sign on, they're automatically logged onto their Facebook pages. But Facebook hasn't been invented yet. And they're looking at themselves fifteen years in the future. After reading Thirteen Reasons Why, I was especially excited to read this book. Add to that the fact that this book is set in the 1990s and involved Facebook, and I knew it was a must-read. When Emma loads her AOL CD onto her computer, she has no idea that she will get a glimpse into her future. But that's exactly what she sees - her Facebook page in fifteen years. Together she and Josh, her neighbor who gave her the CD, are lost in the world of Facebook, learning about their futures as well as their friends' futures. Only their futures constantly change based on even the smallest decisions. As Emma struggles to make her future exactly perfect, Josh struggles with his feelings for Emma. However, Emma soon comes to learn that some things about the future she is better off not knowing...because once she does, how can she change them? This book has such an intriguing premise, and it was very well executed. Haven't we all wished that we could see what our future holds? I loved seeing how little decisions could affect status updates and bigger decisions could change the course of their lives. Reading this book certainly makes you think about how little decisions impact your life. Beyond that, one of my favorite things about this book was the time setting. I loved revisiting the 90s - reading this book was like a trip down memory lane. I also enjoyed the alternating points of views in this novel; they allowed me to feel connected to both of the characters, and I cared about both of them. Emma especially had a lot of growth as a character. Aside from seeing into the future, everything about this book was very realistic and it made for a very enjoyable read. Although the 90s references may not matter much to current teens, there are still many aspects of this book that would be appealing. Occasionally the plot moved a bit slowly with emphasis on Emma trying to figure out her life. While I enjoyed some of these moments, at times I just wanted to know what would happen next. With that, I would also love to know what really does happen for these characters fifteen years down the road. 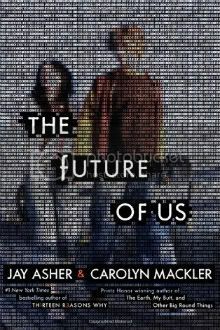 Once again, Jay Asher, along with Carolyn Mackler, has written a novel that carries a great message about how choices impact your life. I will look forward to reading more from both of these authors in the future! This is going on my TBR. Great review! This is going on the TBR! Great review! totally on my tbr list too! thanks for the review!